Overview: Launched Old Navy’s first ever app, designed to encourage users to engagement with the brand and share while actually in the retail stores, a time when the user is most likely to engage and least likely to get distracted by other brands. 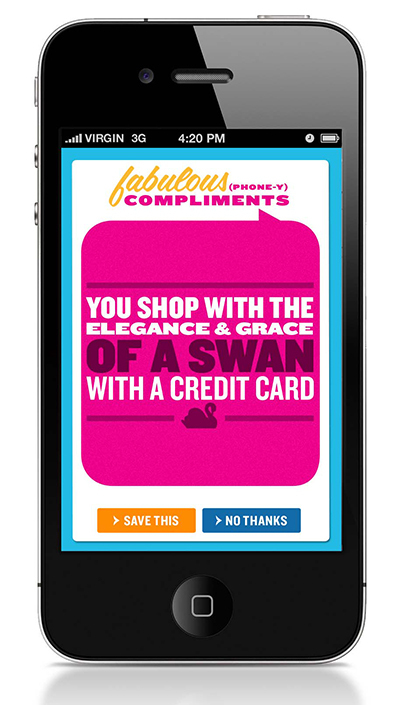 The app is designed to be a fun way to get discounts on Old Navy purchases. The Ask: Create a coupon program. The Challenge: Coupons as our parents know them are dead. The target audience (12-18 and 39-49) knows when a brand is trying to talk to them and often feels that the brand is talking down to them. The Solution: Our target audience naturally has their phone in hand at all times while shopping. An interactive and playful app is the best way to encourage in-store use. With this app, the user snaps a photo of an Old Navy logo. Once the logo is captured, a colorful spinning wheel animates in and lands on a discount, or a number of fun, fashion based games. There is also a large social component to the app that encourages users to share and connect on Facebook, further driving buzz and awareness. The app was wildly successful amongst teens and moms alike. Currently the app holds over 11 thousand four+ star ratings and over 500 YouTube tutorials uploaded by users eager to share.